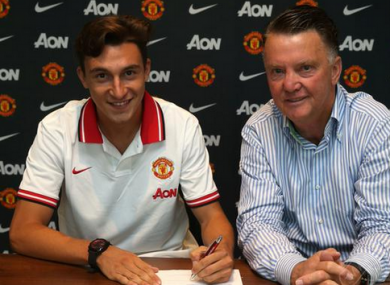 Matteo Darmian has joined from Torino. Darmian will bolster the defensive ranks at Old Trafford. MANCHESTER UNITED’S PURPOSEFUL recruitment drive shows no sign of relenting as they completed the capture of Italian full-back Matteo Darmian. The arrival of the 25-year-old comes hours after the Premier League club announced they had agreed a fee with Bayern Munich for the services of Bastian Schweinsteiger. Louis van Gaal confirmed a fee, believed to be in the region of £12.7 million, had been agreed with Torino on Friday and a four-year deal was signed on Saturday. The defender made 146 appearances for the Serie A club and has 13 caps for the Azzurri, including appearances in all three of Italy’s games at the 2014 World Cup. “To work with Louis van Gaal, a manager that has achieved so much in football, is such an exciting prospect,” he said. “It is a dream come true to be joining Manchester United. I have loved the time that I have spent at Torino and I would like to thank the club and the fans for everything they have done for me. It’s another statement of intent from Louis van Gaal as he looks to assemble a squad capable of bringing the Premier League trophy back to Old Trafford after two barren seasons. Darmian’s arrival will be a welcome addition to United’s defensive ranks but will cast further doubt over Rafael’s future at the club with reports linking the Brazilian to Turkey. The Red Devils begin their pre-season tour of America on Monday with their first game of the new campaign against Tottenham on 8 August. Whether David de Gea will still be a Man United player by that stage remains uncertain. With the news of Iker Casillas’ move to Porto, it’s expected de Gea will replace the legendary goalkeeper at Real Madrid. Casillas departs Real having amassed 725 appearances since making his debut away to Athletic Bilbao in 1999 and won five La Liga titles and three Champions Leagues. Email “Man United are sending out a statement of intent with Italian defender latest to arrive ”. Feedback on “Man United are sending out a statement of intent with Italian defender latest to arrive ”.